This entry was posted in Assurance, Assurance of salvation, Calvinism, Chan, Christian, Christianity, Cross, Easy Believism, Eternal Security, Faith, Francis Chan, Free Grace, Hope, John MacArthur, John Piper, Lordship, Lordship Faith, Lordship Salvation, Love of God, Reformed theology, Religion, Resurrection, Salvation, Secure salvation, Security of the believer. Bookmark the permalink. Daniel, Hebrews chapter 1 is one of the best passages of scripture for refuting Jehovah’s Witnesses false teachings about Jesus Christ. If he upholds “all things” them how could he be a created thing? Is he upholding himself? This is a quote from Psalm 102: 24-27. This shows that Jesus is the one spoken of in the Psalm. The Psalm is about Jehovah! Not only that but Jehovahstretchrd forth the heavens “alone” and spread abroad the the earth by himself. No one but Jehovah was involved ! Isaiah 44:24 and Job 9:8 prove this ! So the one spoken of in Hebrews 1:10 MUST be Jehovah! The JWs teach that Jehovah AND an created angel (their “Jesus”) created the heaven and the earth. JW’s don’t believe that everlasting life is available (since 1914 or sometime). Take them to Matt 16:13-17; point out that Jesus says that Peter’s answer came from Jehovah. Then turn to John 20:30-31 to establish that life is through believing that Jesus is Christ, Son of God. Finish with John 5:24 and ask them if they believe the testimony of Jehovah concerning Christ i.e. that if one believes that in Christ the Son of God, that they have everlasting life. If they say no (and they will) point out that they do not affirm what Jehovah witnesses concerning Jesus Christ and that you do because you recognize Jesus testimony to be the same as the Father’s testimony. Be careful, be polite and be prayerful they will become uncomfortable and defensive. Daniel, I have prayed for you to have wisdom and courage in speaking with them, and that they would soften their hearts toward God and His word. Daniel, ask them if they think Abraham is in heaven. Then ask them why. Then, show them Romans 4. Also, ask them who Jesus is. Then, show them John 1 from a real Bible. Guys. The Jehovah’s witnesses i mentioned before are coming today. What do I do? No matter what they say, I will not refrain from the truth! Charles – you will be held responsible for encouraging someone to read the little ‘abridged edition’, which you may miss many here have studied, read, and refuted the original edition. It is false. So as both John and I Rom 16:17 above, we will mark and avoid in obedience to what we are told in the Scriptures. Men like Calvin cast God’s Word behind their back in favor of his own Institutes, and put people to death for speaking against them. The fruit of his doctrine, and the fruit of his works were both bad. It persuades me to recall the days and nights I spent calling on His name on a number of different ways out of fear I’ve not done it properly or with sincere or correct motives. It was wasted time, gripped by unnecessary fear and anxiety since I believe I had already trusted on the Lord at that time. The Lord is able to use experiences such as this, but I am confident He’d rather His children not suffer them. Benchap, I agree with you about Romans 10:9. I am generally uncomfortable when I see this included in a presentation of how to have eternal life. Thus why judging someone’s behaviour is no way to determine their salvation. I’ll leave it with this then, if someone wants to learn about the truth of the Father, Christ and the Gospel, they are better reading the Bible than the writings of a heretical man, because the Bible does not say we should read error for our profit. That is not wise. Nor is your attempt to promote doing so to all who will read this comment section. I am not attempting to be unkind, nor is there any malice in my words. I fully agree that it’s up to judge what someone teaches or writes. I never said otherwise. I also said that I did not agree with Calvin on some things, bu I agree with him on others. For some things, I couldn’t make heads or tails of it. There’s a big difference between faulting someone’s theology, and seeing the absence of spiritual fruit in their lives (love, joy, peace, patience, kindness, goodness, etc.) For example, I personally do not believe that Mormons are Christians, yet judging by the evidence of their lives (some of them) they show evidence of being born again. Just because they reject the idea that Jesus Christ is God in the flesh does not mean that I can’t love them (some of them) or respect their compassion and caring for others. Here’s the bottom line, and after this I’ll drop out of this conversation: I found it profitable reading my little abridged translation of the Institutes, so much so that I felt it worth my effort my time saying so in this forum. Your mileage may differ, Regardless, you can purchase a copy very cheaply, and it my be something that you would want to consider. Thanks, and God bless, CC. Romans 10:9 isn’t about receiving eternal life. Many confess the Lord but reject the Gospel (by not believing it). And we are told to judge righteous judgement. I regularly judge the Gospel presentations of others. This is not about pride, but about standing for the only Gospel that itself alone saves souls. Will there be some Mormons, etc in heaven? Probably. But there will be millions more in hell due to being conned by the false Gospels in those churches. And yes, many will have their theology judged at the great white throne because they rejected the Gospel. That’s why sites like this exist – to save the lost and help the beguiled (lost and saved alike) to see the truth. You defending a false teacher in the name of unity (while condemning those who call their teachings what they are as proud) is not an act of love. You are enabling and praising beguiles of people’s souls! Charles, yes it is up to us to judge whether what someone writes, or says, comports with scripture! People will tell you all sorts of ways to have eternal life, trying to use scripture to prove it. Many of the ways contradict scripture. Not all roads lead to eternal life. One receives eternal life only one way – by grace alone through faith alone in Christ alone. Charles, you might stay away from the abridged version if you want to see the truth about Calvin’s institutes, as well as how they were to be held up as equal to Scripture, just as the Roman Catholic’s do. By the way, it’s not love to not let someone know the truth. In November 1552, the Council declared Calvin’s Institutes of the Christian Religion to be a >>>”holy doctrine which no man might speak against.” Jacques Gruet was soon to find out for calling Calvin a hypocrite. For not appreciating Calvin’s ‘approach’ he was tortured and eventually beheaded. He was not the first. Calvin’s institutes are littered with fawning over Augustin/Augustine, who was Manichaeist in thinking, spawning (I believe) both Roman Catholicism and Calvinism. Calvin even had the hands of an infant chopped off because he/she slapped the parent. You said a few things regard the Institutes and Calvin that concerned me greatly. I really began to appreciate Calvin’s approach. Reading Calvin …is a deep and profitable experience. The Bible tells us to mark and avoid those who bring a doctrine contrary to the one we learned (Rom 16:17-18). We are not to admire, appreciate or find appealing or profitable something that does not line up with Scripture. We don’t go in and try to split the baby from the bathwater or the meat from the bones, but we submit to God and resist the devil. Only Scripture is proven to be profitable to us (2 Tim 3:16-17). We also are told we will know these false prophets by their fruits, and Calvin’s doctrine, his manner of life, his murderous ways, nothing to be admired. I sure pray you might consider searching the Scriptures to see if what Calvin said was really so. He murdered someone for going against infant baptism. The Bible nowhere tells us to murder heretics, but of course we know of Servetus. Besides the 56-57 people he was directly responsible for having killed, he exiled people from their homes and from the city for nothing. This man was worse than the Popes of his day. Jesus Christ is the only one who can determine whether a particular theology is faulty or not. This decision is not mine, yours, or some priest, bishop, or pope. If we confess with our mouths that Jesus is Lord, and believe in our hearts that God raised him from the dead, we shall be saved. Romans 10:9. Everything else is just window dressing, used by selfish and proud men to sow dissension and discord. Only one thing counts: is your name written in the Lamb’s Book of Life? I imagine that many Pentecostals, Catholics, Mormons, and (yes) even Calvinists have their names so written, and many do not. It’s simply not up to us (sinful men) to judge someone else’s theology — we simply have enough trouble taking care of our own. And I daresay that when we come face to face with God, all our theology will be judged faulty. Benchap, I agree with you completely. If someone has and promotes faulty theology, how can you respect their scriptural grounding and say they “know their Bible”? Can you disagree with a person’s theology but appreciate his grounding in scripture and pastoral concerns? Absolutely! I have good friends who are Pentecostal, and we disagree on issues like speaking in tongues, the baptism of the Holy Spirit as an additional baptism after spiritual rebirth, etc. My best friend as an adult was Roman Catholic, and we had many theological differences, but he was still my best friend (he’s dead, now.) I personally disagree with my pastor in the details of the Second Coming, but he knows the Bible and has a caring pastoral ministry. We can have differences of opinion and still respect and love each other. You mossed the point. I didn’t recommend Calvin ‘s THEOLOGY.I recommended his approach, which I found Biblical and pastoral. You can disagree with someone’s theology but appreciate his grounding in scripture and pastoral concerns. Besides which, I believe that Calvin would disavow many modern ‘Calvinists’, and they would disavow Calvin. Charles, we don’t recommend Calvin. He was a Calvinist, as it turns out. I posted some comments here several months ago, and read with interest the discussion those comments generated. I concluded that there seemed to be some confusion about what Calvin taught, so I decided to do what I could to find out what he taught. I purchased an abridged translation of the Institutes, and read it. It was a revelation! I agreed with some things I read. I disagreed with others. There were passages that I could not understand. However, through it all, I really began to appreciate Calvin’s approach. I found it very appealing, even though I couldn’t accept parts of it. Tara, welcome and thanks for your comment. Fruit inspection is an affront to the gospel, no matter who promotes it. McGee may have said he refuted Calvinism, but he still held parts of reformed teaching! Just thought it was important and you might want to know. My comment: Many Calvinists use this verse as a proof text that faith, rather than, or in addition to eternal life, is the gift of God. 2. Canons of Dort: But those who do accept it and embrace Jesus the Savior with a true and living faith are delivered through him from God’s wrath and from destruction, and receive the gift of eternal life. My comment: Nowhere in the Bible does it say that one receives eternal life by embracing Jesus the Savior with a true and living faith. But, this is is how many Calvinists and Lordship “salvationists” interpret James 2. You would appear to have bought into this interpretation, to some extent, based on what you said in one of your previous comments (You said: I can see two sides to Unconditional Election — fruit in keeping with repentance is so important that it appears to be a condition of salvation. ). Eventually, that resourceful twentieth century expositor, John MacArthur, would go on to divine roughly 48 different varieties of faith in the passages of Holy Scripture, all from the single Greek root “pisteuo,” such as dead faith, living faith, professing faith, possessing faith, saving faith, faith that works, faith that claims to be authentic but does not have works, etc. etc. My comment: Nowhere does the Bible say that God automatically strengthens all believers in grace. Rather, we are told to grow in grace. After reading your short post dated December 24, 2015 at 10:02 AM, it occurred that our apparent difference of opinion isn’t Biblical or doctrinal, but semantic. I can fully accept the statement of faith you posted, and I would like to describe what I mean by semantic differences. By “Calvinist” I mean those who fully accept the points of doctrine promulgated by the Canons of Dort, 1618. By “Arminian” I mean those who fully accept the points of doctrine promulgated by the The Five Articles of the Remonstrants, 1610. By “Calvinistic” I mean those who accept some of the Canons of Dort but reject others. I could have used the term “Arminianistic”, but the latter term is not in my spelling dictionary. In any case, “Calvinistic” and “Arminianistic” mean exactly the same thing. These terms I also see as gradations, in other words, one can be more or less Calvinistic, and more or less Arminianistic. Finally, just to make it very clear, I do not intend to argue with you or cause any unpleasantness, especially on Christmas Eve. I do not believe that God decrees that anyone be cast into hell. I am not a Calvinist. I have described myself as a three-and-one-half Calvinist, but that means that I am just over halfway Calvinistic. I am by no means Calvinist, and I have the scars of arguments with Calvinists to prove it. The statement of faith you posted strikes me as professing four points of Calvinism. It’s not Calvinist, but it is Calvinistic. What I means is this — the statements can be found among the points of the Canons of Dort. I’m not trying to insult you, but merely pointing out that whatever difference we have are not real differences but depend on the form of words we use and the meaning we attach to those words. Here is what I mean. I hope you think this is fair, If you think I am mistaken, please let me know. In any case, I hope we can have a conversation keeping in mind Romans 14:1 and Hebrews 10:24. Wishing you all the best this Christmas, Charles Carter. You: Each member of the human race is fallen, sinful and lost. You: By Grace alone through Faith alone in Jesus Christ alone is the only provision God has made for the salvation of mankind. You: There is no regeneration for anyone until he has believed in Jesus Christ as his Savior. You: The believer is eternally sealed with God’s Holy Spirit and secure until the day of redemption. Each member of the human race is fallen, sinful and lost. By Grace alone through Faith alone in Jesus Christ alone is the only provision God has made for the salvation of mankind. The moment a person receives Christ as his Savior, immediately, he is regenerated and indwelt eternally by God’s Holy Spirit. There is no regeneration for anyone until he has believed in Jesus Christ as his Savior. We reject the Reformed teaching that regeneration happens before a person trusts in Christ as Savior. The believer is eternally sealed with God’s Holy Spirit and secure until the day of redemption. Romans 3:23; John 3:7; I Corinthians 6:19; Ephesians 1:13-14; Luke 24:49; Titus 3:5. “Man has both dignity and depravity” . it is what is NOT said that can do more damage than what is said . (Gen. 1:26;2:17; 6:5; Psalm 14:1-3, 51:5; Jeremiah 17:9; John 3:6, 5:40, 6:53;Romans 3:10-19, 23, 5:12, 8:6-7; Eph. 2:1-3; 1 Tim. 5:6; 1 John 3:8). In essence my wife and I experienced what Holly wrote above. What I love about expreacherman blog is from the very beginning of my posting here Jack and John always pointed me to scripture the Word of God . I see a pattern over and over again now of souls who post here at expreacherman to try and defend their favorite Bible scholar and or their own opinions of systems of thought. I’d be asked ‘what are you’? And when I responded with the fact I was a Christian, the answer would be ‘what kind’? A Christian. In my Christian High School, I became familiar with the reformed and the Arminian theology, and I reflect on the fact, back then I knew it wasn’t lining up with God’s Word. It wasn’t plain and clear. The obvious flaws in the systems of their theological bases were tearing and eroding at the truth of His gospel. I’m truly not sure there is any ‘extreme’s’ exactly with TULIP. Although we know some take it to extremes, we have to look to the logical conclusion that each of these points lead to. I just have to denounce them all as maligning the Lord’s character (again when properly understood and taken to their logical conclusion). I have watched over the years, friends fall into the system, and praise God for His goodness and for the truth of His Word, I’ve made friends as they’ve come out of this man made system of thinking. Factions and sects. Carnality. Wisdom of men. One ‘gentleman’ I had a conversation with who identifies as a ‘high Calvinist’, shows the fruits of his walk down the broad way. I wrote an article about the “Total Depravity of certain Calvinists”, his thinking affected me so greatly. I like to think I am a peacemaker, but not a peacekeeper, which is more conciliatory, and I’m not sure that’s at all what God wishes for any of us. It’s not about rejecting extremes, but rejecting anything that sets itself up against the knowledge of God, and I firmly believe both do. You can certainly use polemical if you prefer, I see the systems and people propagating them as enemies of the gospel. I take no pleasure at all in that, it is to my dismay. Worse, they malign the precious name and character of my dear Lord, it troubles me greatly. I find no fellowship with these unfruitful deeds of darkness. Total depravity doesn’t have two sides. And TULIP can’t really be split up. If you really understand the five points (not knocking your obvious intellect), you must know they all stand or fall together. To be moderate is really just to compromise in my humble estimation. Fruits meet for repentance is immediately answered in context with what they need to change their thinking regarding — and that is that being children of Abraham guarantees them an entrance into heaven. Perseverance of the saints is indeed a muddle. But I would say so for different reasons than you. That is, that it has nothing to do with eternal security. It is a proof system, a backdoor works program where your imperfect efforts prove you are saved. Works cannot be loaded on before, during or after. God doesn’t grade us on some curve. Saints can be both barren and unfruitful and even forget they’ve been purged from their sins (2 Pet 1). We cannot know whether one has been saved, however, if they have believed, that is the only parameter to judge themselves by, not by works or their own perseverance. If they have believed, it is the Lord who will keep them. Your understanding of Limited atonement and Irresistible grace aren’t quite clear either. My mother came from a Methodist family, my dad from Church of the Open door, but as far as what Romans 8 and Eph 1 teach, again, I would disagree that the Bible seems to teach predestination (according to the Calvinist school of thought). I’d suggest Tom Cucuzza’s series on Ephesians, I believe chapter 1 is divided up into about 4 lessons, I ‘think’ you might appreciate the teaching. Lastly, your ending made me sad. Because in essence what you are doing, is appreciating a false theology because a religion supplied you with what felt like a soothing answer. I really suggest you find your answers in His Word. To be fair, Calvinists aren’t the only one that come up with the speculative deserted island scenario, and so my best advice, is flee religions, and choose the needed thing (Lk 10:38-42). Apply your heart to His knowledge (Pr 22:17-21), but don’t think of these wicked men (Calvin, Zwingli, Knox, Luther, etc. as someone to be worth hearing. Their works, their fruits were apparent. They were murderous, and hated God’s chosen people, even cursing them. Their end will be in His hands where I believe they will likely see Him at the Great White throne. I do hope I’m wrong on some. You were right that Calvinism does tend to lead away from evangelism. I have seen some fall into it who have lost their wisdom (he who wins souls is wise) because they have been lulled, almost drugged into this euphoric state of they can share it as God give’s opportunity, but God will make the ones who are they elect believe regardless of what one does. Anyways, I am sure I have gone on long enough, and late enough. God bless your celebration of the birth of Christ, however you choose to do it. Proverbs 5:5: Trust in the Lord with all thine heart; and lean not unto thine own understanding. One major problem with any theological system, especially the Five Points, is that it depends on individual interpretation. By nature, I am a conciliator who likes to find a middle way, usually rejecting the extremes. Unfortunately, this doesn’t work when discussing Calvinism. The most polemical (if I can use that word) take an all or nothing approach — on both sides. I can see two sides to Total Depravity. I’m moderate on this, I believe that all people are imperfect, but like you, all are not completely unable. I can see two sides to Unconditional Election — fruit in keeping with repentance is so important that it appears to be a condition of salvation. The fifth point, Preservation of the Saints, to me is a muddle. I have family members that seem to have fallen away, yet “once saved, always saved” is a comfort to me. The two points that I reject also seem to have some scriptural basis. As to Limited Atonement, some people will be saved and others will be thrown into the lake of fire, so in this sense, the atoning sacrifice of Christ does not reach them. As to Irresistible Grace, I do in fact believe that Grace is irresistible to a child of God. I’m Baptist, but my Father’s family is Methodist, and I have spent a lot of time in Methodist churches, I agree with Methodists about predestination, I DO NOT BELIEVE IN PREDESTINATION. Yet, in Romans 8 and Ephesians 1, the Bible seems to teach predestination. I’ll end with a story about how I came to appreciate Calvinism. I was raised to believe that those who never had the opportunity to hear of Christ were lost. As a child, this did not seem fair to me — why should a person be condemned to hell because he lived on a remote Pacific island and never had a chance to be saved? When I was a young man, a Calvinist supplied the answer, which was Effectual Grace. God provides a means for all the elect regardless of their circumstances. If the Pacific islander is elect, God provides the means for his salvation regardless of the fact that geography precludes the preaching of the Gospel and that he may never have heard the name “Jesus Christ.” This really appealed to me at the time, although I have since come to see how it leads to a state of mind that is anti-missionary. I appreciate your thoughtful responses, and I wish you a peaceful and joyous Christmas, CC. My comment on 5 Point Calvinism. I don’t think you can just accept one, two or three points without accepting all 5 of it. All of its points are all tied together and interrelated as one false doctrine. It’s all intended to be one big cup of man-made kool-aide doctrine to drink. The truth is, we are all offered the gift of forgiveness, grace and eternal life. It doesn’t matter how we came to believe this good news after we heard it or just read it in the word of God. Does it really matter some particular way, or means, or circumstance of how we came to know the meaning of the truth of the gospel of our salvation? One thing that sickened me about Carey’s heavy emphasis on Sovereignty (Calvinistic viewpoint) of God, was his son Felix’s tragedy with a storm and his wife and two children drowning. He said God had done it to him, and feared it was his son’s fault, he must have ‘declined in divine matters’. That’s the problem with believing God causes everything to happen, and that if it’s bad, that God did it to you. Charles, I consider both Calvinism and Arminianism to stand against the Scriptures, both as you saying being close to each other in many teachings. That does not sound like a man who has taken heed to 1 Cor 4:6. I reject all 5 points of Calvinism. Total Inability (true meaning of Total Depravity), Unconditional Election (to heaven or hell), Limited atonement – Christ was the propitiation, not only for us but for the whole world, Irresistible grace is answered in most places, but I particularly like Acts 7 speech by Stephen, and Perseverance of the Saints, well, I believe in eternal security, but this is God’s preservation, His keeping of His Saints, not the other way around. As far as the ‘choosing’, the question to ask is chosen for what? And as far as us being able to choose, like the Psalmist says, I have chosen the way of truth. Oh, by the way, Carey’s ‘evangelical’ missionary style still incorporated the five points of Calvinism, so he could be a wonderful missionary, and so can many Mormons, or Roman Catholics like Mother Teresa, but what gospel are they preaching? Charles, you said in one of your previous posts that you are not a Calvinist. Then, in your most recent post, you identify as a three and one half point Calvinist. “Whosoever will” is not “man-made” salvation, or cheap grace. I will let you know in advance that this is a grace forum, and not a sounding board for a continuous, protracted debate on Calvinism. Calvinism and grace are not compatible. Should you wish to continue to promote ANY of the false tenets of Calvinism, you will have to do it elsewhere. This isn’t a reply to your post but just a response. If I have time to collect my thoughts in the next several days, I’ll post a reply, but I may not have the time. We see two unfortunate tenancies in this discussion. First, we divide the warring camps into ‘Calvinists’ and ‘Arminians’ and decree that these two camps will always disagree on every point. Second, both camps tend to devolve into extreme versions, the Calvinists into hyper-Calvinism which you eloquently describe in your post, and the Arminians into a radical, ‘whosoever will’ species of teaching that leads to man-made salvation and puts an obligation on God to save man, i.e., cheap grace. I believe that Calvinists and Arminians are a lot closer to each other than Calvinists are to hyper-Calvinists and Arminians are to radical-Arminians. I’m Baptist, and Baptists tend to be either three or four point Calvinists. I would describe myself as a three-and-one-half point Calvinist. It’s true that all people have general knowledge of God. Romans 1 and Psalm 19. It’s also true that only those to whom the gospel is preached have particular knowledge of Jesus Christ.Romans 8. Further, it’s true that God calls certain people to Himself. “He [Jesus] went up on the mountain and called those whom He Himself wanted, and they came to Him.” Mark 3:13. “You did not choose Me [Christ] but I chose you, and appointed you that you would go and bear fruit” John 15:16. I do not cite these two passages as a proof text of any kind, but just to show that God calls some people and not others. As far as I read the scripture (and I hope you can correct me if I’m wrong), all who God calls come to Him (and no, Jonah is not an exception). My comment: Scripture teaches that some Christians only believe for a while (Luke 8:13), and at least one other, Demas, left Paul’s ministry, because he loved (the Greek term used was “agapao,” which is the highest form of love) the world. Whether or not you can conceive of something does not make it scriptural. 2. Missions – the fact that Calvinists conducted missions is of little consequence. So did the Roman Catholics, Mormons, etc. I do not follow their teachings either. 3. We are not regenerated by the Holy Spirit prior to believing the gospel. I think it legitimate for committed Christians to have reasonable differences of opinion on many things. It’s also legitimate for one brother to tell another “why he is wrong” in the process of exploring these differences. I’d like to make two quick comments responding to Dr. McGee, and one response to your post. Unfortunately, this forum doesn’t not lend itself to more complete discussions. (1) Zombies: I agree that we have free will, and can freely relate to God. We are not puppets on a string with God as Puppet Master. However, scripture does not teach (as far as I know) that someone whose heart and soul is spiritually dead and in thrall to sin can ON HIS ON VOLITION come to Jesus — scripture teaches that only the Holy Spirit can convict of sin and awaken the heart and soul to a relationship with God. Likewise, I believe that scripture teaches that a born-again Christian seeks a relationship with God above all else. “As the hart pants for the waterbrooks, so my soul pants for you, o God.” I can’t conceive of a Christian who does not desire a personal relation with Jesus Christ. This does not mean that we are zombies. (2) Missions: Dr. McGee has some particularly harsh things to say about missions and Calvinism, but he is dead wrong as a matter of history. The greatest mission effort in history (outside Acts) was the 18th and 19th mission effort, and these were lead by Calvinists, from William Carey to Lottie Moon. Calvin taught (and I agree with him on this point) that we witness for Christ because Christ told us to (Mat 28:18-20 and Acts 1:7-8) for four kinds of people: (a) the regenerate for their own discipleship and edification, (b) those being saved as the means of salvation, (c) the unregenerate because of the blessings God showers on all people, and (d) not least, the evangelist himself as producing fruit in keeping with his salvation. To say that Calvinism is anti-missions, as McGee does, is just plain loony, and we have living proof in the Korean church, which was evangelized by Calvinists, and today is second only to the US in world missions, sending many Calvinist missionaries to other lands. (3) Draws all to Himself: Well …yes, Christ draws all people to himself, but that does not mean that all become born again Christians, The Lamb’s Book of Life contains a discrete number of named persons, specific individuals whose names are known to God before their birth and that are already written in the Lamb’s Book of Life. There are also a certain number of people who are doomed to destruction (1 Pet 2:8). Judas Iscariot was also doomed to destruction, at least in some translations. The idea that the Holy Spirit issues an invitation to all, and that some accept according to their free will, while others reject also according to their free will, is a false reading of scripture. Human will CANNOT do anything other than to reject the invitation unless and until it has been regenerated by the Holy Spirit, and human will that has been regenerated by the Holy Spirit CANNOT do anything other than accept the invitation. There are other points I’d like to make, but this post is already overlong. I’ll end with this — I’m not a Calvinist, but (as I noted in my first post) I agree with universal depravity, unconditional salvation, and the sealing of the saints. I do not accept irresistible grace and particular redemption. I’m grateful for this opportunity to disagree and share different views of scripture. I also wish Dr. McGee was still in life so that I might have the chance to get his reaction to this. Acts 17:26-27 tells us that He even placed us where we live (bounds of our habitation), and determined the times, – to give us the best chance to seek the Lord, feel after Him – find Him. You mentioned John 6:44 and also Romans 7. Romans 7 is clear that the law is one of the ways we know our exceeding sinfulness which Galatians 3:24 tells us is the school master to bring us to Christ (see also Rom 3:19-20, it points the whole world to Him, not just a few). On John 6:44, context of vs. 45 comes into play. Those who have heard and learned of Him (believed) will come. John 12:32 also answers who is drawn- And I, if I be lifted up from the earth, will draw ALL men unto me. Romans 8:24 says, I said therefore unto you, that ye shall die in your sins: for if ye believe not that I am he, ye shall die in your sins. It doesn’t say, unless the Holy Spirit regenerates you, you will be unable to believe that I am He. He is holding them responsible if they suppress the truth in unrighteousness. It’s a spiritual battle in which our feet need shod with the preparation of the gospel of peace every single day, for again it is the gospel that is the POWER of God UNTO salvation. Neither Prevenient Grace or Irresistible Grace are Biblical teachings. The grace of God has appeared to ALL (Titus 2:11). We have the Word, and it’s entrance into our lives brings light. Why aren’t we seeing more saved now at this dark time in history? I believe it is the false doctrines of Calvinism (preselection by a puppetmaster – and blinding of those not chosen – 2 Cor 4 tells us which god that is) and the equally false teaching of loadship (men working before, during or after their salvation) that are deceiving many as Christ said would happen in the end. People are corrupting minds from the simplicity that is in Christ. Calvinism/reformed is supposedly touted as being one of the fastest growing sects within the ‘Christian’ faith. It doesn’t really matter my opinion, but I firmly believe it maligns God’s good character, and is preaching a totally different Jesus and a different gospel because of all this transformed ‘ministers of righteousness’, which we know are not from Him. Some are more subtle and sly than others which makes them hard to distinguish from others, but the fact that John MacArthur has come out and said you must turn from all your sin and confess your sins or you are going to hell, is apparent he is a wolf in sheep’s clothing. His gospel of both DOG and loadship are false. Ray Comfort’s supposed gospel is one of turning from all of your sin, or you also are not saved. Be careful what men ‘say’ vs. what they really mean because as Jesus warned, there will be MANY deceivers and MANY deceived. Prove all things and hold fast to that which is good (1 Thess 5:21). Hi Charles, I have a couple of thoughts on what you mentioned, see what you think about it. >>and that on our salvation we receive the Holy Spirit as a seal that insures our election. None of these are ‘Calvinist teachings’ though. They are the Word of God, and believe me, this is not part of DOG or TULIP. How they see Rom 3:23 is that sin has caused us to be unable to respond in belief to the truth without being regenerated first. 2 Cor 2 doesn’t suggest that the natural man doesn’t have the ability to believe the gospel, for their are many that explain this is the way it pleases God to save men by, that the gospel is the power of God unto salvation. Otherwise, there would be no necessity for the Holy Spirit to convict the world (the natural man) of the sin of unbelief, righteousness and judgment (Jn 16:7-11). This tells me all have the ability since as Curtis mentioned above, the Lord as made the truth known to all. Calvinists do ‘say’ they believe in salvation being by grace through faith, (i.e. John MacArthur) but what they ‘mean’ is something altogether different than what the Scriptures say. They believe those who were pre-selected from before the world began, are given the ‘gift of faith’ by the Lord giving them the Holy Spirit and only THEN are they able to believe. Nowhere do we see the Free gift being faith, the free gift is eternal life. But that we are told that is what we must do to be saved — believe (John 6:28-29 – Acts 16:31). Man is blinded by the enemy, but we must labor in the harvest, preach the gospel, for how will they believe if they have not heard? The Word does not say how will they believe if the Holy Spirit hasn’t regenerated them first. We are to pray for all men, for it is His desire that all come to a knowledge of the truth and to be saved (1 Tim 2:1-6). But if pre-regeneration was how one was to come to this knowledge, that would be dishonest because God then would only desire the elect to believe, and there is no need for that desire, for the god of Calvinism forces himself upon those he chooses to. Praying would just be busy work that didn’t really have any effect wouldn’t it? But James 5:16 says differently. We are to pray for laborers for the harvest, and obviously there is a reason. Eph 1:13 tells us the order differently than Calvinists teach. It is not by being pre-regenerated by the Holy Spirit, but by the preaching of the Word that people are able to believe (see also Rom 1:16-17; 1 Cor 1:17-18, 21 and 2 Tim 3:15 — which says the Word is able to make us wise unto salvation. James 1:18 says we are begotten by that Word, and 1 Pet 1:23 as well.) Romans 10:14-17 tells us again how we come to faith, and it is not by being pre-filled with the Holy Spirit without belief. (This is what Calvinism teaches). In whom ye also trusted, after that ye heard the word of truth, the gospel of your salvation: in whom also after that >>ye believed, >>ye were sealed with that holy Spirit of promise. Order is pretty clear I believe there. I have more thoughts but already my post is too long. Also, while God is drawing people, Satan is working furiously to prevent people from coming to faith in Christ. One of Satan’s primary weapons is corruption of the gospel by the wide world of churchianity. Mark 4:15: And these are they by the way side, where the word is sown; but when they have heard, Satan cometh immediately, and taketh away the word that was sown in their hearts. don’t know of any studies by Dr Mcgee on what you seek . bellow i posted a comment . Charles, welcome and thanks for your comment. You said: At which point does the Holy Spirit convict of sin and soften the sinner’s heart to God, drawing the sinner to Himself? My comment: The Holy Spirit draws all people to God. I don’t think it is necessarily a matter of a certain point at which the Holy Spirit draws someone. I think it happens in many ways, and may happen many times. Some respond by pretending God doesn’t exist, others by trying to choose their own path to eternal life, and others by accepting God’s way of salvation through faith alone in Christ alone. The Bible teaches that the gospel of Christ is the power of God unto salvation for all who believe (Romans 1:16). I searched the New Testament for the word “grace” and found 130 usages. I also searched for the word “prevenient,” and found none. Accordingly, I don’t think dealing with this question in the context of prevenient grace versus effectual grace is appropriate. I am not sure of any study by Dr. McGee on this matter. The touchstone is not whether a belief is ‘Calvinist’ but whether it is Biblical. I’m not a Calvinist, but I accept some Calvinist teachings: that all have sinned and have fallen short of the glory of God; that we are saved by grace through faith, which is the gift of God, and not by works; and that on our salvation we receive the Holy Spirit as a seal that insures our election. All these are Biblical beliefs, even though they are Calvinist. As I understand scripture, only the Holy Spirit can convict of sin. “The person without the Spirit does not accept the things that come from the Spirit of God but considers them foolishness, and cannot understand them because they are discerned only through the Spirit.” If this is true, then lacking the Holy Spirit constrains the free will of man, and therefore man, by virtue of the fact that he was born a slave to sin, cannot simply by an exercise of his free will choose to accept Jesus’ invitation, EVEN IF HE HAS HEARD IT PREACHED TO HIM DAILY! Paul dealt with this in Romans 7. To me, the question answered by Dr McGee is the wrong question. Individual men and women do indeed possess free will, and I agree with Dr. McGee about this,. The right question is: At which point does the Holy Spirit convict of sin and soften the sinner’s heart to God, drawing the sinner to Himself? “No one can come to me unless the Father who sent me draws them, and I will raise them up at the last day.” One way of dealing with this question is in the context of prevenient grace versus effectual grace. Another method is in the context of universalism (which is not Biblical). Do you know of any study by Dr. McGee on this issue? Thanks, CC. Also Jesus says, “I am the way, the truth, and the life. No man cometh unto the Father but by me.” It’s grace alone, through faith alone, in Christ alone, apart from ANY works. I apologize if I wasn’t clear enough. McGee’s critique on Calvinism brought a lot to my mind that I wanted to share. And I thought perhaps I could brings some clarity to Isaiah 55:7, that we are not told to make a big long list of things that we need to give up or things that we need to do before coming to Christ (it will NEVER be enough), but to admit that we were thinking wrongly about whatever path we were taking (even if it has “good” intentions like Lordship Salvation) and seek the Him for refuge and salvation. That is exactly what I was thinking John. Thank you for sharing with me. God bless you brother! Ben, there are some pretty good pearls in there about the availability of eternal life to anyone (whosoever will) who will accept Jesus as Savior. As to owning up to our sinful condition, we cannot possibly know the extent of it. It is fortunate for us that God’s grace does not require that we forsake our ways or thoughts in order to be saved. If a person knows he is guilty of at least one sin, and trusts in the payment that Christ made to take away his sin, he is saved. 9. A child of God has two births; one of the flesh, the other of the Spirit, giving man a flesh nature and a Spirit nature. The flesh nature is neither good nor righteous. The Spiritual Man does not commit any sin. This results in a warfare between the Spirit and the flesh, which continues until physical death, or the return of the Lord. The flesh nature of the man does not change in any way with the new birth, but can be controlled and kept subdued by the new man as the believer is obedient to the Lord through His Word. John 3:3-7; Romans 7:15-25; Romans 8:8; Galatians 5:17; I John 3~9; I Peter 1:23; I John 5:18; I John 1:8. Excellent commentary on Calvinism by Dr. J Vernon McGee. Thank you Califgracer for sharing this video. McGee made some very excellent points. One is that God gave us free will, and that everyone chose to go their own way (even the Lordship Salvationists) as McGee noted in Isaiah 53. But the Lord loved us enough to take our sins upon himself in human flesh, and endure the wrath that we deserved, just so that we could be reconciled to Him. I was actually listening to Isaiah 53 on an audio tape once while playing the song of Gandalf’s fall from Lord of the Rings for special effects, and I was meditating on the words, and it seemed as if the Spirit somehow supernaturally illuminated that all to me. I also love how McGee quoted a part in Isaiah 55 when the Lord says, “let whomever is thirsty come to drink.” That means ANYBODY and EVERYBODY is invited to come to the Lord Jesus Christ for salvation- no strings attached! I remember having trouble with Isaiah 55:7 as it initially seemed to support the Lordship Salvation notion of “turn from sin to be saved.” Then I rethought it and realized that Isaiah 55:7 could also apply to religious people and moralists who think that God will accept them on the basis of their clean life (Isaiah 64:6 blatantly contradicts that of course). I actually did a commentary on Isaiah 55:1-9 in a FaceBook post not too long ago, and here is an excerpt on Isaiah 55:6-9…. I love how McGee noted that God’s thoughts and ways are not our ways, as this man seems to look at it the same way I do. God is eager to accept us freely if we repent (change our minds- realizing our sinfulness, inability to please God, and need of a Savior- then turn to the Lord Jesus Christ for forgiveness of sins and eternal salvation) and believe the Gospel (that Jesus was the perfect Son of God who bled and died on the cross for our sins, was buried, and rose again the third day- and we personally, from our hearts, trust Jesus to be our Savior). Our Lord is no brutal taskmaster like Macarthur, Washer, Piper, Chan, Platt, Sproul, et al. Knowing that God loves us and accepts us freely ought to help us grow in love and appreciation for Him after we are saved. Fixing our eyes on Him will help us to turn from our sins, not to be saved or to stay saved, but BECAUSE we are saved. Cody, welcome and thanks for your comment. God does not give anyone faith or lack of faith in Christ. The gift of God is eternal life, available to everyone. Anything that implies otherwise is error. Hi my name is Cody! I had a question, was J.Vernon McGee a Calvinist? I used to believe he wasn’t, but after listening through this video about 5 times I cought him saying “when you see a Coca Cola sign and it says Thirsty? You have the choice wether or not you will get a Coke, but some people don’t have that thirst” to me it sounds like he was saying God doesn’t give everybody that call or thirst, but that only those he chose will choose since he gave them that thirst, but those who never received that thirst from God will not choose because God never gave them that desire. Now I know that is not quote for quote, but it gets the point across. Anyway I hope I wrong because I do love listing to Vernon McGee. Welcome and thanks for the link. I hear that Dr. McGee’s Bible tapes are heard much more now worldwide than even when he was still living. thru the bible radio http://www.ttb.org/ free 5 year thru the bible mp3 downloads. Now you turned around and gave me a chuckle with the current event reference to Watergate. You gave me a chuckle today about J. Vernon McGee’s favorite quote, “Where the rubber meets the road.” I heard that the overseas radio networks have the most trouble trying to translate that expression into other languages. By the way, his 5-year Thru The Bible series continues to recycle across the world nearly twenty-five years after McGee’s death. Once, several years ago, I was listening to one of his taped broadcasts. He made a then current-event reference to “Watergate.” So some of the tapes are pretty old. Terry, it was fun to see the different people come up with old quotes. “The Saints and the Aint’s”, or I remember something like, “This is where the rubber meets the road”. Thank you so much for sharing this. 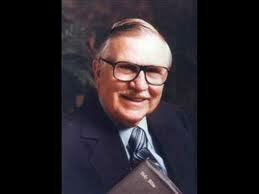 Back in the 80’s Dr. Vernon McGee was one of teachers I listened to when i first got saved? I loved the way he made what ever topic he taught on so clear! Line by line Scripture teaching ! So to hear this really brought back memories! Good ones thank The Lord. He could not have made it any clearer . ” Free Will !” Who so ever will! We are not Zombies! I’m going back and listen to some more! Nice to have you join our discussion again. Thanks so much for giving us that insightful background on J. Vernon McGee’s early Reformed affiliation. This helps us to understand that he certainly knew of what he spoke when he, in later years, spoke out against Calvinism. You were privileged to know McGee personally. Had the opportunity to know J. Vernon McGee personally. He obtained his B.D. (M.Div.) from Columbia Theological Seminary in Atlanta, GA. Where he was taught Presbyterian Calvinism. He then obtained his TH.M. and TH>D. from Dallas. Before accepting the Pastorate at the Church of the Open Door in LA, he Pastored a Presbyterian church in Pasadena, CA. He was no stranger to Calvinism/Reformed theology. He gave an invitation every Sunday Morning at COD. The people who responded were asked to go to the back of the auditorium where they were met by a counselor. The above was conveyed to me in 1976. McGee was at the Cannon Beach conference grounds in Oregon. We had early morning coffee together each day and a two hour conversation each day. He had personal convictions regarding many controversial subjects. He was against the then rising New Evangelicalism. However some Fundamentalist types thought McGee too lenient on some subjects. He was a good and spiritual man who provided good teaching and an example to young preachers on how to teach the Bible verse by verse. While had humor woven in much he did he was not an entertainer. Today some teachers are over the line in entertainment and family and other stories. It reduces the effect that the word of God should have in bringing conviction. Just tried the video from several ways and they all worked. No more ideas — you are the expert!! Welcome — sorry it failed. will check it out. Good to have you drop in. We have a lot of readers so you may have caught it at a busy time. I was available to view it on YouTube though. Thanks so much for that amazing video..I had not heard that from McGee, What a wonderful, clear, logical explanation of the lie of Calvinism, even with a touch of McGee’s humor. I pray all of our friends and readers will watch and listen.